On January 20, 2014, 75-year old Jonas Jaunius Trinkūnas (b. 1939), founder of Lithuania’s pagan revival Romuva, as well as being an ethnologist and folklorist, passed away in Vilnius, Lithuania. Jonas Trinkūnas was born on 28 February 1939 in Klaipėda. He finished primary school in Kaunas in 1957 and in 1965 he earned a degree in philology at the Vilnius University Faculty of Lithuanian Language and Literature. While still a student he founded Indijos bičulių draugija (Society of Friends of India). The Vedic traditions of India were what pushed him to search for the roots of Lithuanian culture and its spiritual meaning. In 1967 J. Trinkūnas and his friends organised the first Rasos (Summer Solstice) celebration in Kernavė, which was the start of a great “singing revolution”. Three years later the KGB tried to erase from the nation’s memory the Rasos celebration in Kernavė, but in every corner of Lithuania folklore and ethnographic ensembles had begun to form, the bonfires of Rasos celebrations were lit, candles burned on Vėlines (All Saints Day) — symbols important to the cultural vitality of the nation. J. Trinkūnas was one of the founders of Vilnius University’s Ethnographer Ramuva society. Folklore studies, trips to Lithuanian villages with hundreds of students for the purpose of writing down Lithuania’s living culture, songs, traditions, awakened from Soviet lethargy the hearts and souls of those who even now continue to call themselves ramuviai and žygeiviai (“travellers”). From 1969 to 1973 J. Trinkūnas worked at the Faculty of Philology at Vilnius University as a post-graduate and lecturer. The folkloric movement was so dangerous and unacceptable to the Soviet government that those who organised and participated in the traditional holiday celebrations were persecuted by the KGB as the greatest enemies of the Soviet empire. In 1973, for his dissident activities, J. Trinkūnas was forced to leave the University. Until 1988 he was forbidden from engaging in any scientific research work and activities in his profession. Therefore, for more than two decades, J. Trinkūnas dedicated his life to studying the living traditions of Lithuania. Travelling from village to village and helping the people in their many various daily activities, he listened to and learned their songs, stories, customs and beliefs. These experiences were more valuable than any university and turned the Ramuva folklorist into a true believer of Romuva, who discovered in the folk memory a thousand living springs of the nation’s spirit and raised it to the level of a symbol of the ancient Baltic faith. With the beginning of the Sąjūdis (the Reform Movement of Lithuania), J. Trinkūnas was able to return to the University and worked as an assistant at the Ethics Division of the Institute of Philosophy and Sociology. In 1990–1993 we held the office of Head of the Ethnic Culture Division of the Ministry of Culture. From 1994 he worked as researcher at the Ethics and Ethno-Sociology Division of the Institute of Philosophy and Sociology; he lectured on ethnic culture at Vilnius Pedagogical University, participated in numerous international conferences and events related to old pagan faiths, authored many articles in Lithuanian and foreign press, wrote several books. He was a member of the ritual folklore ensemble Kūlgrinda, Etninės kultūros draugija (Ethnic Culture Society), Tautos namai (Home of the Nation), Mažosios Lietuvos reikalų taryba (Board of the Affairs of Lithuania Minor), Prūsa club and other organisations. J. Trinkūnas’ scientific and ethno-cultural activities bloomed during the Atgimimas (post-Independence period in Lithuania). When Trinkūnas was Head of the Republic of Lithuania Ministry of Education and Culture’s Ethnic Culture Division, this division cared not only for ethnographic and folklore ensembles, issues on Lithuanian education and culture in Lithuania Minor and Kaliningrad, but also extensive publishing activities. As Head of the Ethnic Culture Division, J. Trinkūnas demanded that a special Jonas Basanavičius Award be founded, which would stimulate folklore research and activities. This was also the same time when the idea was raised to found the Council for the Protection of Ethnic Culture, accountable to the Seimas, which even now continues to implement the Law on National Protection of Ethnic Culture. 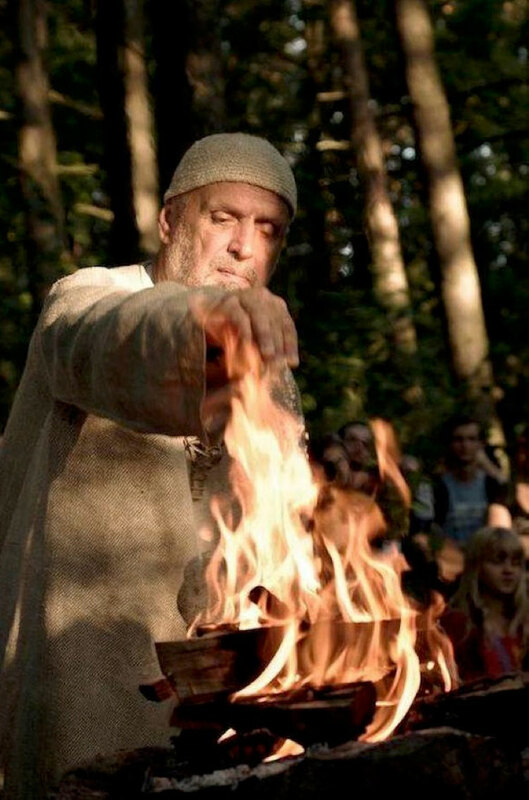 In 1992, together with his followers, J. Trinkūnas registered the Romuva religious community, which later included all of the communities throughout Lithuania and became the community of the ancient Baltic religion. In 1998, at the World Congress of Ethic Religions (WCER) in Vilnius, J. Trinkūnas was chosen as this organisation’s Chairman. Later, as Chairman of this Congress and spiritual leader of the Lithuanian Romuva, he was invited to different events in India, Australia, USA. In 2002 J. Trinkūnas was ordained as Krivis (HIgh Priest) of Romuva and was given the name Jaunius (lit. jaunas — “young”), symbolising the rebirth of the ancestor’s faith. In 1997, along with Venantas Mačiekus, for the organisation of the Ramuva cultural reform movement, Jonas Trinkūnas was awarded the State Jonas Basanavičius Award. In 2013, on the occasion of Statehood Day, for active anti-Soviet dissident activities, organising of ethnographic activities as well as underground distribution of religious and nationalistic literature, Jonas Trinkūnas was awarded by the President of Lithuania the Order of the Grand Duke Gediminas. Unfortunately, Krivis Trinkūnas’ lifelong goal that the traditions of Lithuania’s ancestors in the form of the Romuva faith be legalised and recognised as an official religion has unfortunately still not been realised. Jonas Trinkūnas’ funeral is planned for Thursday, where his cremated remains will be buried at Rokantiškes cemetery. He leaves behind a grieving widow, five daughters and three grandchildren, as well as the whole Romuva community, in whose hearts Krivis Jaunius will remain forever. J. Trinkūnas’ family asks that all those who would like to honour the deceased donate to the construction of Romuva’s temple. Also, the family asks that his spirit be honoured by lighting a candle or writing a few memorial words.